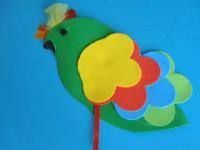 Children will love to walk around with this parrot on their shoulder. 1. Gather your material. 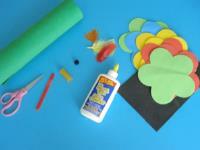 You will need green Fun Foam, red, green, blue, yellow, and red Fun Foam flowers, a tiny piece of black Fun Foam, scissors, a colourful Popsicle stick, white glue, a small black pompom, a piece of dry pasta (macaroni, rigatoni, etc. ), and a few colourful feathers. 2. 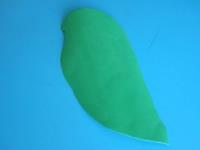 Cut a basic parrot shape out of the green Fun Foam. 3. 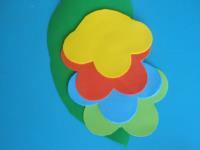 Layer the Fun Foam flowers to create a colourful wing. Cut the top flower to give it a rounded shape. 4. 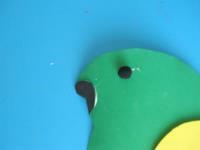 Trace and cut the contour of the parrot's beak out of the black Fun Foam and stick it in the correct place. 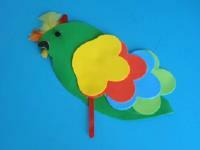 Glue the black pompom on the parrot's face to represent its eye. 5. 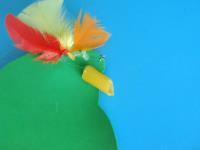 Glue a few feathers on the parrot's head. Slide the Popsicle stick under its wing and glue it in place. Children can use it to hold their parrot. 6. Cut the dry pasta piece to give it a pointy beak-like shape. Glue it behind the parrot's head. 7. Your parrot is ready to fly around the daycare!